The weather as we left Dunedin was cool and cloudy and the two hour drive to Timaru along the northern Otago Coast was pretty but uneventful. Our only stop along the route was to see the Moeraki Boulders. The giant spherical rocks have become an attraction and the guide book said that they were not to be missed. They were certainly interesting but I'm glad that we didn't have to drive out of our way to see them. We pulled into the Avenue Motor Lodge in Timaru around lunchtime and fortunately our room was ready for our early check in. After staying at so many hotels we know exactly what the elements of the perfect hotel room should include and the Avenue Motel fit the bill perfectly. The Avenue Motel was exactly what we needed as we had not worked on the blog for a while and had a ton of laundry to do. Paul spent the afternoon and evening working on the blog and Kris did the laundry - what bliss. And we enjoyed it so much, we forgot to take a picture. Timaru was a nice little coastal town but the weather was not good so we did our sightseeing from the car and then stopped at the supermarket to buy food for dinner. We ended our day in the two person spa bath with a bottle of wine! When we were in Christchurch earlier, we had visited a Maori Art Gallery where we admired a collection of really fabulous weapons carved from native woods and green stone. We did not purchase anything but as we had not seen anything as nice in any other galleries we decided to stop in Christchurch on our way to Hamner Springs and to take a second look at the weapons. In the end we purchased a beautifully carved axe. Puti Hauraki, Gallery Owner holding the Maori axe we purchased. Our next stop was Hanmer Springs, an alpine spa village a two hour drive from Christchurch through spectacular alpine scenery. The view from the Albergo Hamner. Our bed and breakfast for the next two nights was described in the brochure as a place where magic happens ! Albergo Hanmer is owned by Bascha and Beat Blattner, a very nice Swiss couple. The setting of the B&B was definitely magical and the presentation of the breakfast meals was most definitely the most flamboyant I have ever seen. Our hosts, Bascha and Beat and the substantial breakfast served every morning. Yes, we DID eat everything ! Our main reason for visiting Hanmer Springs was to experience the thermal pools and to be pampered at the spa with body and facial treatments. Paul was not particularly bothered about the body treatments but knowing that this kind of pampering appealed to Kristine he suggested a two night stay in Hanmer Springs. Kristine spent about half an hour looking at the Spa brochure and chose four treatments but she was very disappointmented when Beat called to make a reservation to find out that they were booked up for the two days and that the only "pampering" available was to sit in a private thermal pool and have a massage. We decided that was better than nothing and booked for the next day. We went off to explore the small town which was packed with families many lined up to go into the thermal pool. Kristine had expected the thermal pool to be similar to the Blue Lagoon in Iceland, a natural rock pool of steaming water. This pool just didn't look very appealing. Hopefully the private pool would be better. We arrived at the Spa for our treatment and followed the attendant to a small private room that contained a pool of warm water. The thermal water didn't feel any different from any other water! Our one hour massages were OK but not the best we have ever had. All in all the Hanmer Spa experience was not that great. We spent the rest of the day relaxing and reading. Later that evening we went into town for a light dinner and returned to the B&B to watch a DVD - "The Holiday", a chick flick that was totally unbelievable mindless entertainment. Kaikoura is a two hour drive from Hanmer Springs and famous for two things: year round whale watching and crayfish. Our B&B in Kaikoura the Nikau Lodge is perched on a hill overlooking the town and the ocean. We started with a walking and driving tour of the city and went for a walk along some rocks and then up onto the cliff-top. We did see a couple of seals, and from a distance, a lot more, but we couldn't get close, except for one. We only had one day in Kaikoura and we wanted to see whales. Apparently there are sperm whales in the area pretty much all year, so your chances of seeing them are good. We had two choices - by boat or by helicopter. The boat was cheaper but the weather was rather windy and it looked pretty rough, so we went upmarket and took to the air. We quickly spotted whales ("thar she blows !") and spent the next thirty minutes circling various whales and avoiding all the other aircraft that had joined us. Although we both enjoyed the experience and it was neat to see whales in their natural element, they don't actually DO very much except swim and blow air out of their blowholes and finally dive out of sight, so thirty minutes was probably enough and I'm glad we didn't get seasick. Kaikoura was our last stop on the South Island so we drove up the coast to Picton to catch the Inter-Islander ferry back to Wellington. Along the way, we did some sightseeing to a pretty waterfall and to an area of rocks COVERED in seals, so we could get much closer this time. We arrived at the terminal a little early so they put us on a ferry that was about to leave. We were literally the last vehicle to load and then off we went. As this was the reverse of the ferry trip we had taken a few weeks earlier, we mostly stayed below and relaxed, but the scenery was still spectacular. The boat in the picture really gives you a sense of the scale. We had two goals for our day in Wellington. Kris wanted to see where they had filmed Rivendell for LOTR and I wanted to see an exhibition about Pompeii at Te Papa, the National Museuem. As the weather was rather windy and cold, we decided to start with Rivendell - actually a very pretty Regional Park called Kaitoke. Trevor was able to join us so off we went. The park itself was easy to find and their was even a sign to Rivendell, but we never did identify any specific location from the film. We did take a very pretty walk through the rain forest and it all looked like Rivendell to us. 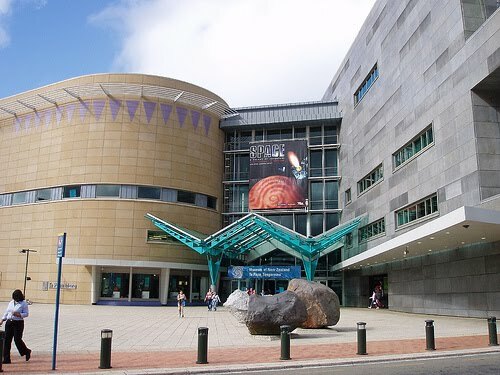 Our second stop was Te Papa, the National Museum of New Zealand. Here's a picture from their website of the exterior. The "Day in Pompeii" exhibition (which was about the day Vesuvius erupted) was very interesting although I think we were expecting a bigger exhibition. We both enjoyed it - especially the rather creepy plaster casts of people and animals who had been caught in the ash. Over time, their bodies had dispappeared, leaving a void in the ground showing just how they had been lying when they died. Like I said - creepy. After Te Papa, we picked up Karen from work and after a quick trip home, went out for what turned out to be a rather good indian meal. Again, a very pleasant evening with friends. What could be better ?